UV Sun rays are more intense in summer season so if you go out in season without proper skin protection then scorching sun rays will adversely affect your skin and may turn it into rough, dull and dark skin. 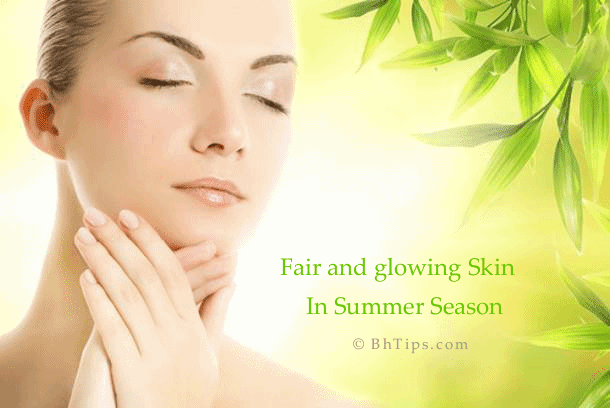 Summer sun tanning or darkening of skin is quite common as compared to other seasons. Hence you really need to follow a proper skin care routine to protect your skin from summer skin tanning. First of all try to drink plenty of water because it not only keep your body hydrated but also remove toxins from your body.Water requirement during summer season is increased because a lot of water is lost due to excessive sweating during summer season.So try to drink daily at least 12-14 glasses of water. Every night massage your face with cold milk because it cleanses your skin, removes the dead skin, moisturizes the skin and give you smooth and Fair glowing skin even in summer season.